Enzo Maccarinelli suffered the seventh defeat of his career as he lost to WBA light-heavyweight champion Jurgen Brahmer in Rostock, Germany. The Welshman's trainer, Gary Lockett, pulled his fighter out after the end of the fifth round with the 33-year-old's right eye completely closed. A clash of heads in the first round caused the problem, with German Brahmer, 35, also suffering a cut eye. But southpaw Brahmer increased the damage with his accurate left hand. Former cruiserweight world champion Maccarinelli had hoped his height and reach advantage would prove the difference against Brahmer, who has lost just two of his 45 contests. But while Maccarinelli was badly hampered by the damage inflicted to his right eye midway through the first round, Brahmer was hugely impressive as he took control from the second round onwards. A series of left hooks increased the swelling on Maccarinelli's face, with the German also landing with some punishing upper-cuts that left the Welshman reeling. The challenger was almost retired on his stool at end of second round but pressed on, surviving the third round and then starting the fourth on the front foot, landing a crisp left hook that briefly rocked his opponent. But still the eye injury remained - the swelling now creeping down his cheek - and Lockett warned his fighter he had one more round left before he had to throw in the towel. That prompted Maccarinelli into one final push at the start of the fifth, but he failed to land a telling punch to end the contest and Lockett wisely called a halt before the start of the sixth round. 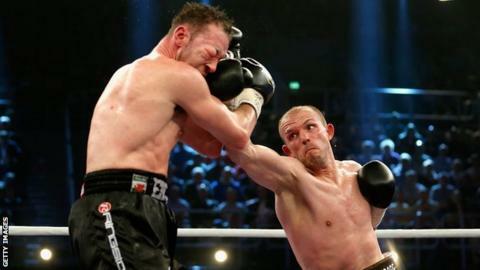 Former WBO cruiserweight champion Maccarinelli came into the 45th fight of his career on a run of three wins, including a revenge stoppage of Ovill McKenzie to win the Commonwealth light-heavyweight title. Brahmer is not a world champion in the strictest sense - Kazakhstan's Beibut Shumenov is the WBA 'super' light-heavyweight champion and he fights IBF title-holder Bernard Hopkins on 19 April. Two of Maccarinelli's Welsh compatriots, Lewis Rees and Liam Williams, fought on the undercard in Rostock. Welterweight Rees drew his eight-round contest against Renaldo Garrido, while light-middleweight Williams maintained his unbeaten record by stopping Yuri Pompilio in their eight-rounder.